I thought about not posting this but they are just too cool not to. 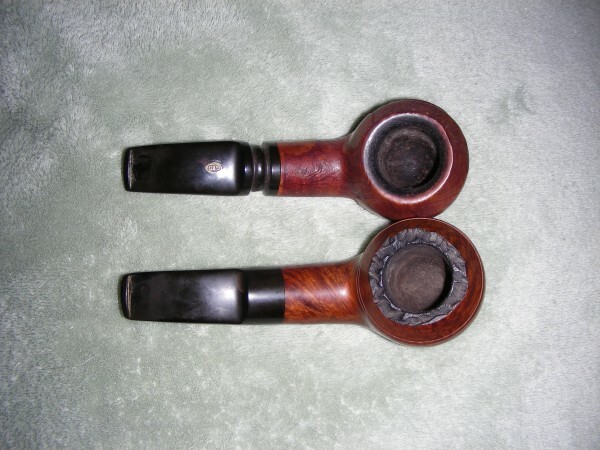 Here are a couple pipes that came up for a great price and, thanks to Mr. Neeb for selling my Pete, I had the coin to pounce. The great thing is, I didn't know these existed. When I saw one come up, I had it bought within a few seconds but was too slow to get the second one. The third one however, found its way into my cart. What are they? 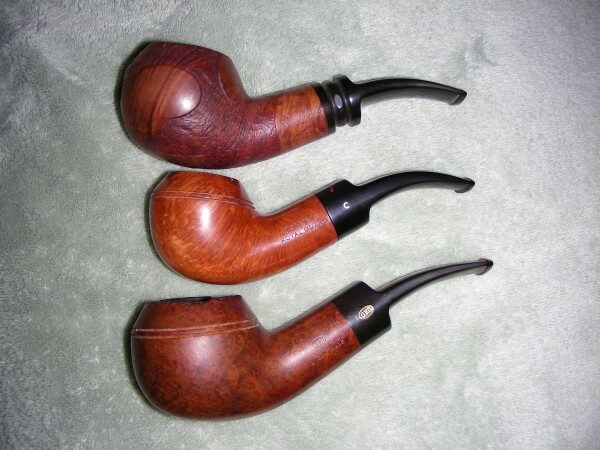 A couple of GBD Colossus 9676s, one an International and the other a Tapestry. They are in really nice shape too. When they say Colossus, they mean it. The bowls are a full inch in diameter and just shy of two inches deep. I put a pic with a Comoy's Rhodesian of a similar shape for comparison just so you can get an idea. I'm stoked to get these cleaned up but I'll have to dedicate a half day to smoking one . Man, those are some heavy duty pipes! Nice score. I have 3 Internationals but, frankly, I find their bowls to be very thin and, therefore, burn hot. I hope you have good luck with them. I bet you could smoke like a mad man and never heat those puppies up. 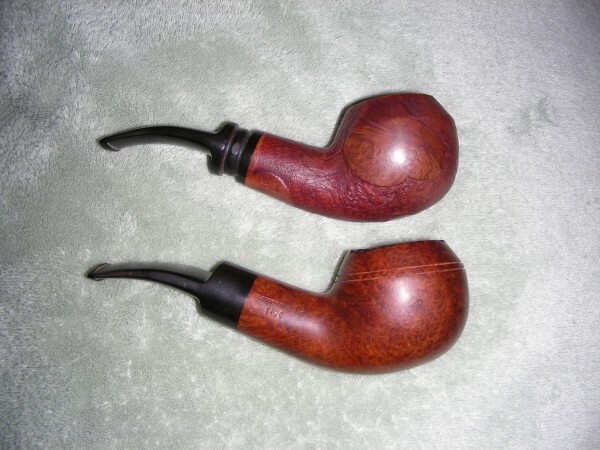 Congrats on your newest pipes, I hope they all smoke great for you. Beautiful pipes, way to go! If you could kick the person in the pants most responsible for your trouble, you wouldn't sit for a month. Beautiful - that's my favorite shape - hope they do well for you. - Write if you get work. - Hang by your thumbs. Real beautiful pipes and great shapes, congrats man. Very nice! Big, very big! I have a Charatan pot with a bowl diameter of just over an inch, it takes forever to smoke that thing! I usually only pack half a bowl in that one. Me too, I tend to search them out when I can. I prefer the taper stem but the saddle stem is a close second. One of my top 20 too. Be sure to post some after pics. 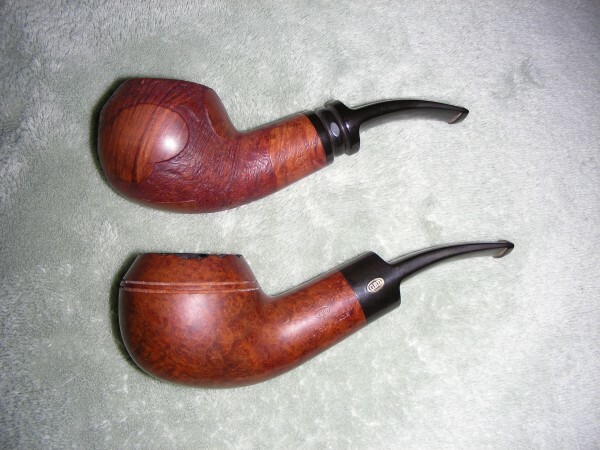 Wow, two fantastic 9676 Colossus pipes. Welcome to the 9676 Colossus Owners Club, I think it might just be you and me! The only other 9676 I've seen in three years is one Mike had a BriarBlues, a perspex stemmed Virgin sold in July?. Here is mine, a "Seventy-Six" model. This one was a gift to me from forum member "Weezil". It is one of my prized GBD's. Captain, I just looked at these again. Thanks for posting your work. I get jazzed by seeing the work that you, and the other guys who post resto work here, do. I learn from your work, and feel like it makes be better at cleaning up the poor and unfortunate burners that enter my pipe-cave. I haven't, yet, of finding a Rhodesian (or a bulldog for that matter) that just fits me yet. Looking forward to that day. Very nice. I love both. Nice job.